North America's leader in oil services for shale drilling had quite the up-and-down year. Can we expect more of the same? Check out the latest Halliburton earnings call transcript. 2018 wasn't exactly the best year for Halliburton's (NYSE:HAL) investors. Last year, Halliburton's stock declined close to 45% after a surge in drilling activity was so productive that most producers exhausted their capital spending budgets with a few months left in the calendar year. So on top of the decline in the broader market, Wall Street has been anticipating that its upcoming earnings results will be decidedly weak. That may be the case. For longer-term-thinking investors, though, a weak quarter or two in an otherwise growing business could represent a buying opportunity. So let's take a look at what could be in store for Halliburton's stock in 2019 and whether this recent price drop provides a chance to make a smart purchase. Will producers be as ambitious as management thinks? On Halliburton's earnings conference call a few months ago, CEO Jeff Miller was incredibly optimistic about his company's prospects for 2019. One of the things he pointed to as evidence for a strong 2019 was higher capital spending plans from North American producers. Those statements were made several months ago, when oil prices were around $70 per barrel. That may not necessarily be the case anymore, as oil is now closer to $45 per barrel. To be fair, Miller did note that several of the producers he spoke to had strong hedge positions -- futures contracts in place that guarantee price upon delivery -- that should make their earnings look better than what current oil prices indicate. If that is the case, we could see better results from Halliburton. If oil prices remain low for some time, though, producers could fulfill all of those futures contracts and be exposed to current prices. That would likely lead to much lower capital budgets. Will the services market tighten even further? A confluence of factors in the oil patch has made it much less profitable for service providers in recent years. The most significant one is that producers, equipment, and services companies have become much more efficient at drilling and fracking shale wells. The downside to efficiency is that fewer rigs and crews are needed to complete the same number of wells. Lower demand for these things led to an oversupply of equipment and crews that the service industry has been working through ever since the previous oil crash a few years ago. Halliburton has done its part to alleviate this glut by keeping some equipment idle and not deploying new crews unless it could achieve a certain rate of return. That hasn't been the case with all oil services companies, though. Others that haven't had the size and financial strength of Halliburton have at times taken service jobs at low or even loss-making rates just to keep some revenue coming in the door. As a result, margins and returns haven't been great for the entire industry. Here is another trend that Halliburton's management anticipates changing in 2019. On top of the typical wear and tear that will lead to some equipment becoming no longer viable, Miller has said on numerous occasions that several clients are now asking for more technologically advanced options to get more out of each well. That should play well into Halliburton's (and largest competitor Schlumberger's) hands, as they have been touting new tech for the oil patch such as artificial intelligence-assisted drill navigating to ensure the drill bit stays within a shale layer. The hope is that the move into higher-tech options versus retired equipment will help to diminish the supply of equipment and give Halliburton more pricing power. If that does come to pass, we should expect Halliburton's margins to improve significantly. 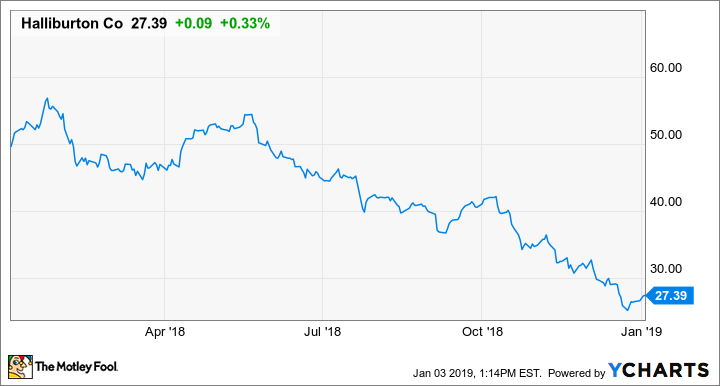 Is 2019 the year to buy Halliburton's stock? Things were really looking up for Halliburton in 2018. Oil prices were on the rise, and North American shale drilling has been taking market share from other sources. This surge in production ended up being too much of a good thing, though, as it stretched the capacity of transportation infrastructure and resulted in many producers having to hit the pause button on spending as early as October. Now, with oil prices down in the $45-a-barrel range, it's entirely possible that producers will curtail spending even longer. Longer term, though, there are some factors working in Halliburton's favor. New production will need to come online to offset the natural decline of existing assets and any incremental demand growth over the next few years. The more companies put off spending today, the more they will need to spend down the road. Chances are 2019 will look a lot like 2018 in the sense that the market could swing wildly in a matter of a few months. The good news for anyone looking to buy is that shares are down close to 45% on the year and haven't been this low since 2010. That is a lot of negativity baked into a company that has a dominant market position in North American shale drilling.